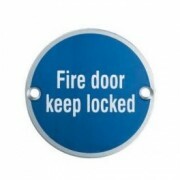 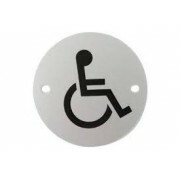 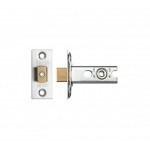 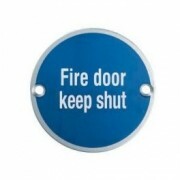 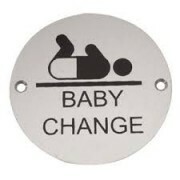 Baby Change Pictogram Symbol 76mm dia screw fixed Black infill symbol on either SAA or Satin Stainless Steel ..
Disabled Pictogram Symbol 76mm dia screw fixed Black infill symbol on either SAA Satin Stainless Steel or Polished Stainless Steel .. 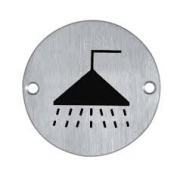 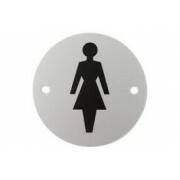 Female Pictogram Symbol 76mm dia screw fixed Black infill symbol Plate Material Available Satin Aluminium, Satin Stainless Steel or Polished Stainless Steel .. 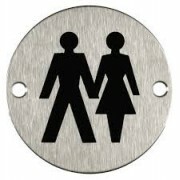 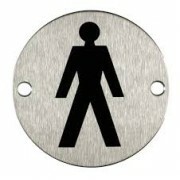 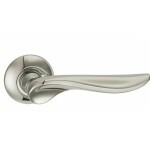 Male Pictogram Symbol 76mm dia screw fixed Black infill symbol Plate Material Available Satin Aluminium, Satin Stainless Steel or Polished Stainless Steel ..
Shower Pictogram Symbol 76mm dia screw fixed Black infill symbol on either SAA Satin Stainless Steel or Polished Stainless Steel ..
Unisex Pictogram Symbol 76mm dia screw fixed Black infill symbol on either SAA Satin Stainless Steel or Polished Stainless Steel ..